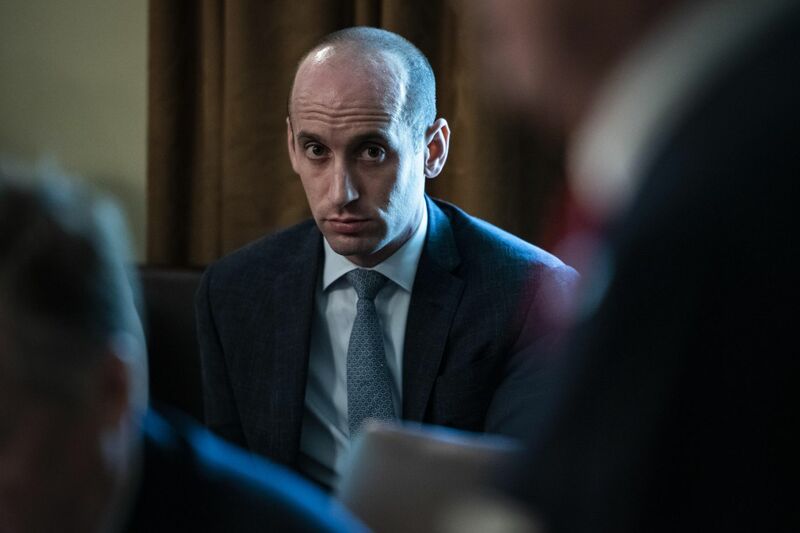 The talk of bringing Miller before lawmakers comes days after The Washington Post reported that he played a key role in a plan first discussed last year to release undocumented immigrants into "sanctuary cities" represented by President Donald Trump's Democratic critics. While the plan never came to fruition because of objections from agency officials, Trump has since embraced the idea. House Judiciary Committee Chairman Jerrold Nadler, D-N.Y., on Sunday cited Miller's role in developing the targeted-release plan in calling on him to testify. "Steve Miller, who seems to be the boss of everybody on immigration, ought to come before Congress and explain some of these policies," he said in a CNN interview. Miller, a former congressional aide whose title is senior policy adviser, has played a central role in the Trump administration's aggressive and controversial immigration policies since its earliest days — helping to orchestrate the January 2017 executive order that barred travelers from seven countries and suspended refugee admissions. Regarding the policy of targeting sanctuary cities — jurisdictions that do not fully cooperate with federal immigration authorities — for the release of undocumented immigrants, a congressional investigator told The Washington Post, "It was basically an idea that Miller wanted that nobody else wanted to carry out." Rep. Kathleen Rice, D-N.Y., chairwoman of the House Homeland Security subcommittee on border security, facilitation and operations, said in an interview that Miller needs to come before her panel to "make his case for these terrible policies to the American people instead of being this shadow puppeteer." "It's clear that he's the one pulling the strings," she said. "And if he's going to continue advocating for these policies and personnel change, then he needs to come before the American people and explain himself. He has to be held accountable." Press secretary Sarah Sanders said during an appearance on "Fox News Sunday" that the administration was "looking at all options" regarding the targeted release plan. The proposal, she said, is not an "ideal solution" but is one that could be implemented if Democrats refuse to negotiate with Trump on border security. Trump, meanwhile, conducted a Saturday night Twitter back-and-forth with Democratic Oakland, California, Mayor Libby Schaaf with a suggestion that she and other mayors did not want to host immigrants detained at the border. "If they don't want to serve our Nation by taking care of them, why should other cities & towns?" he said. Schaaf, who last year oversaw the strengthening of Oakland's sanctuary policy and warned residents of an upcoming federal immigration raid, told Trump to "stop fanning hate and division" in a tweet of her own. "Oakland welcomes all, no matter where you came from or how you got here," she said. Trump and his deputies otherwise spent the weekend pushing congressional Democrats to take legislative action to address the border crisis. "Democrats must change the Immigration Laws FAST," Trump tweeted Saturday. "If not, Sanctuary Cities must immediately ACT to take care of the Illegal Immigrants." In a Sunday appearance on NBC News' "Meet the Press," White House counselor Kellyanne Conway accused an "unserious Congress" of not taking tougher action to stop migrants from crossing into the country. The legislation, he said, "will deter people from Central America from continuing to come, change our asylum laws, make sure you have more than 20 days to deal with an unaccompanied minor, and you can send people back to Central America." Graham said Republicans were hoping to garner Democratic support for the legislation: "I'm going to try to find a compromise here." House Homeland Security Committee Chairman Bennie Thompson, D-Miss., speaking on ABC News' "This Week," said he was willing to sit down with Republicans to discuss legislation but laid the crisis squarely at Trump's feet. "Before Donald Trump took office, we had a situation that was manageable — we had spikes, but it also went down. But what we have now is a constant pushing of the system so that it doesn't work," Thompson said. "Rather than being punitive, the president has to step up and provide real leadership, which he's failed to do on immigration." "We don't see Stephen Miller as an expert," Thompson said. "He's a young man who has some novel ideas that most Democrats disagree with." Some are already in effect, such as Trump's recent national emergency declaration and the practice of "metering" asylum claims at border stations — leaving migrants to either wait weeks for entry or seek apprehension by entering the United States illegally between official ports of entry. Others are under consideration, such as a plan called "binary choice" that would give migrant families the option of remaining detained together or agreeing to a separation that would allow children to remain free from custody. "Every single one of those policies, I believe, is driven by Stephen Miller and proudly embraced by Trump, and they're illegal on some level and yet they're still trying to do it," Rice said. "We can do what we're meant to do, and we can have oversight." Rice said her panel will probably request e-mails and documents to determine to what extent Miller and other White House officials pressured agencies on these controversial policies. In 2014, for instance, lawyers for President Barack Obama refused a request from the House Oversight Committee to allow David Simas, the president's director of political strategy, to testify regarding an investigation into White House political activity. Two years later, Obama foreign policy adviser Ben Rhodes also refused to testify before the same committee, citing executive privilege.